We love finding places to stay that give us access to some big skiing but are small, friendly, cheaper to stay and easier to get to. Big-name resorts offer unrivalled convenience if you’re prepared to pay a premium to be among all the action. 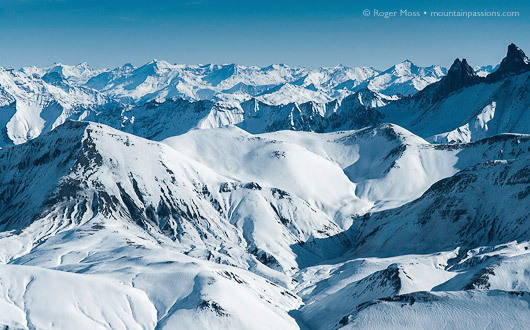 Purpose-built, high-altitude resorts also ought to be snow-sure throughout the season (and often beyond), while it’s also possible to find ski-in ski-out accommodation. As well as laying the first tracks of the morning and being last to ski down the slopes at the end of the afternoon, you needn’t even bother to take off your boots before heading to the bar for a spot of après-ski. However, if you’re skiing with your family or are on a tight budget, you might be feeling that the time has come to think carefully about your priorities. 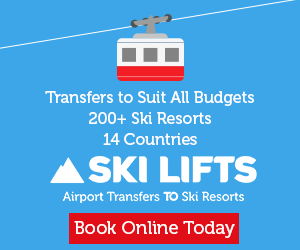 Here’s where lift-linked great value ski villages start to look attractive, giving you the best chance to get things right for your family or fellow skiers, whatever their needs – and your budget. …if you’re skiing with your family or are on a tight budget, you might be feeling that the time has come to think carefully about your priorities. 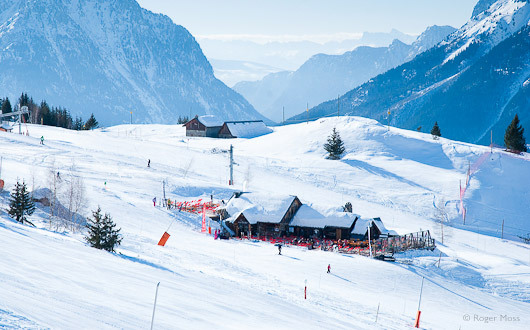 Tucked away in a secluded valley off the Grenoble-Briançon road close to Le Bourg d’Oisans, Vaujany is easily accessible for anyone travelling from the UK, and just happens to be linked by cable-car into the Alpe d’Huez Grand Domain ski area. Vaujany is also linked to its near-neighbour Oz-en-Oisans, another great value ski village which also offers lift access to Alpe d’Huez. Vaujany has a lot going for it. 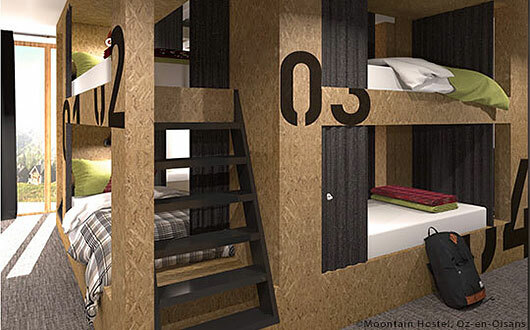 There’s varied accommodation, a covered pedestrian walkway with escalators (great for getting back to your accommodation at the end of the day), along with friendly restaurants and bars with real-world prices. As a base for both mixed-ability and non-skiers, its own terrain offers hours of relaxed skiing before you head over to Alpe d’Huez for the serious stuff (including the legendary 17km La Sarenne piste). The village has a leisure centre with pool, ice rink, crêche and spa centre, and offers family-friendly activities every day. Similarly,Oz-en-Oisans, has high-speed gondola links into L’Alpe d’Huez and has some of its own learner slopes, plus some challenging steeps. The traffic-free village is great for children and has some competitive budget prices for self-catering ski holidays, plus flexible budget accommodation at the recently established Moontain hostel. 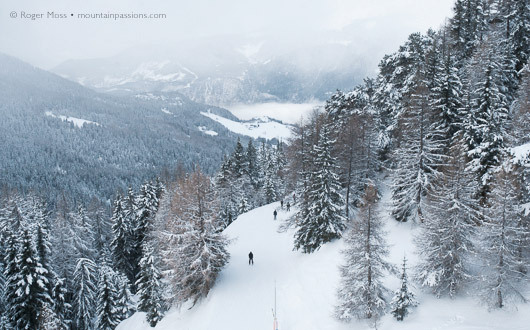 Image: Gentle slopes at Vaujany, linked to big resort skiing at Alpe d’Huez. Located just south of Megève, the Espace Diamant brings together the ski areas of the Val d’Arly with those around Hauteluce and Les Saisies in and around the Beaufortain. The result is currently one of the best-kept secrets in the French Alps, with a wealth of varied terrain and a great snow record, thanks to the nearby presence of Mont Blanc. If you wish you can even ski a whole circuit comfortably in a day. 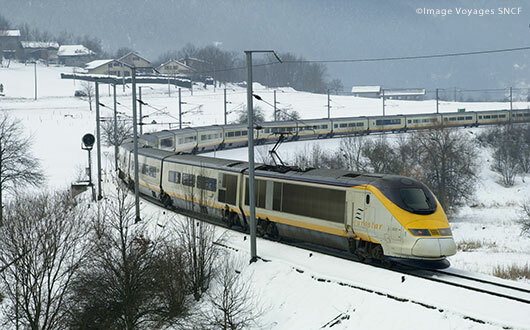 Stay in one of the linked villages and enjoy an authentic French ski holiday with bags of charm. Crest Voland has its own small family-friendly ski area with easy links to Les Saisies and in good conditions, a delightful long green run through the forest back to the village. Notre Dame Bellecombe or Flumet, which is not very far from it’s chic neighbour Megève, are both directly linked into the 185km of pistes in the Espace Diamant. Image: The snowy rooftops of the village, Crest Voland. Just a very short distance from the A430 autoroute and the town of Moutiers, Brides-les-Bains is a traditional spa town with plenty of hotel accommodation and a modest village centre. It can be a cost-effective base from which to ski the extensive Three Valleys, to which it’s linked (into Méribel) by gondola lift. Offers and low-season prices can get you a large, comfortable hotel room on a half-board basis, or there are relatively new self-catering apartments on the edge of the village. Learners and young families should head further into the 3 Valleys to linked great value ski villages such as La Tania or Courchevel Moriond which we stayed at and skied in 2017. Close to the modern Aquamotion spa and aquatic centre, with excellent shops and restaurants and some reasonable prices, Courchevel Moriond has a good variety of accommodation choices that are slightly less budget-busting than in Courchevel 1850. Also, if you are a beginner or don’t need Three Valley access, you can buy a Courchevel lift-pass and be thoroughly entertained on the slopes between Moriond and La Tania. 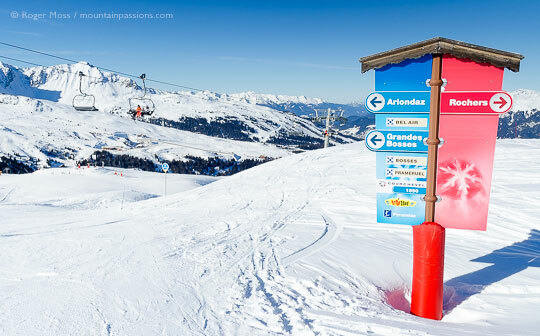 Image: View past ski piste signs to chair lift at Courchevel Moriond, French Alps. Part of the justifiably-popular Val Cenis Vanoise ski domain, Termignon is one of the great value ski villages. Sitting at 1300m, it has an unpretentious, welcoming vibe, with rapid access to its own pistes, including some of the most stunning views of the Vanoise massif, and you’re in the Haute-Maurienne. Finally, a two-way link via the Turra 6-seater high-speed lift into Val Cenis was added a few years ago, so skiers based in Termignon profit from the best of both worlds, with a slightly shorter drive, easy access, plus lower-priced accommodation close to the pistes. 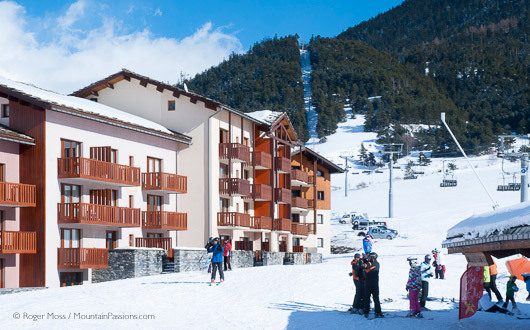 Image: The front de neige at Termignon with self-catering piste-side apartments. When the ski areas of La Plagne, Peisey Vallandry and Les Arcs were linked by the Vanoise Express, the largest and most audacious of all cable cars, it created the world’s second-largest linked skiable domaine. 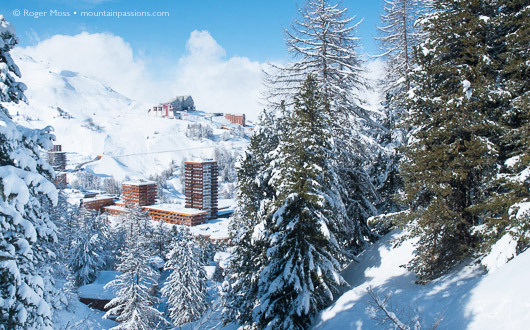 Undoubtedly one of the most popular ski destinations in France, it can be quite pricey, especially if you want the full Paradiski ski-pass. There are places, though, where you can find quiet tree-lined runs, small village restaurants and a friendly family vibe at more modest prices. Look lower to the great value ski villages such as the former mining community of Montalbert (1350m) which now has a high-speed lift, Les Coches (1450m) and Montchavin (1250m), once a forlorn mountain hamlet, but whose fortunes were transformed when it linked to La Plagne for the 1973 ski season and instantly became a fully-fledged ski village. Six reasons to stay in a lift-linked village. Accommodation prices are lower away from the big resort centres. This is especially true at the beginning and end of the season, but check online for the best last-minute deals. Try the resort or village website, or the local Tourist Office. Many outlying villages now have direct access to the big ski areas via a high-speed lift or cable car. They can get busy at weekends and peak periods, when locals take advantage of the rapid access (and easier parking) but outside these times you won't find the big queues can slow things down higher up the mountain. Traditional mountain villages remain picturesque throughout the year and are generally unspoilt by huge car parks, high-rise buildings and heavy traffic. They're also easier to access, avoiding stressful mountain drives. It's a simple fact that the higher the altitude, the colder it gets. If you've got a non-skier in your party, or young children to entertain during the day, a lower village setting will have milder temeratures more suited to outdoor activities, a spot of sunbathing or a drink on a sunny terrace - especially towards the end of the season. 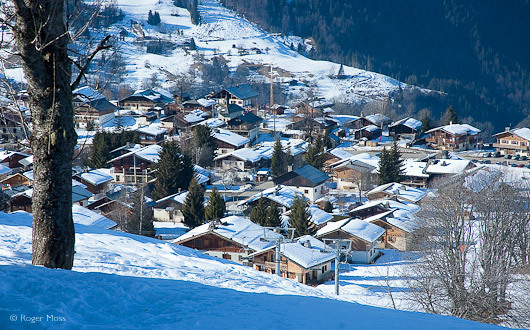 Many linked villages have their own small ski area which is perfect for novices and young children. Advances in snow-making keep these areas and major return runs open for as long as possible. Villages are more likely to have a real, year-round living and working community. Prices in the local shops will therefore be more realistic, and you'll find authentic local produce on sale.